It’s been a long hot summer here on the Rideau. Hot, humid, and with very little rain. Lots and lots of sun, and not many days like this. To be fair this shot was taken last spring when it’s supposed to rain. But still. The odd rainy, unseasonably cool day over the past few weeks would have gone down a treat with me. 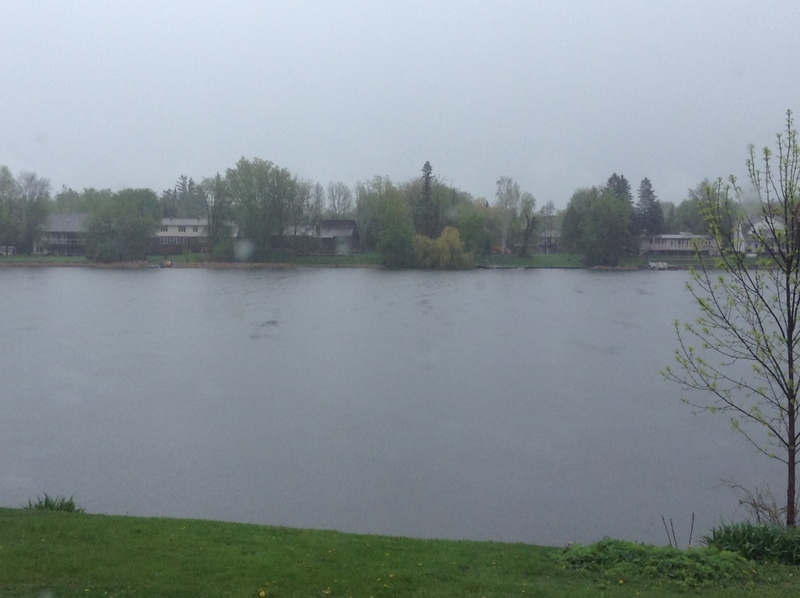 A rainy day on the Rideau… perfect for reading. That’s because I’ve been stuck into a great book a few times this summer… unwilling, and even unable, to come unstuck. And there’s nothing better than a cool, rainy day to justify doing nothing but read… all day. 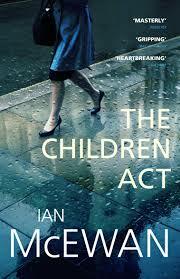 I was hooked on Ian McEwan’s book The Children Act from the first few pages. I probably would have read straight through the first night, but I couldn’t bear to rush it. McEwan’s prose is made to savour, so lovely and lucid. He’s one of those writers, in my view, who makes writing look easy. When, of course, it isn’t. 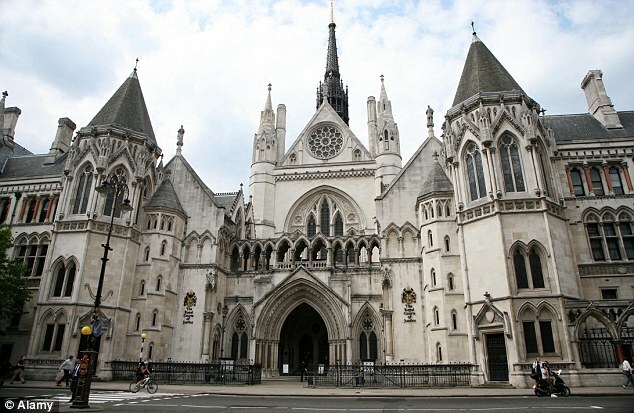 McEwan’s main character is Fiona Maye a judge in the High Court of Justice, Family Division in London. Fiona is fifty-nine, and married without children. Her life is elegant, well-ordered, inordinately civilized. But, she is about to experience major disruption in her marriage. As well as embark on a disturbing court case which will change her forever. For instance, Fiona must decide whether conjoined twin boys should be surgically separated to save the life of one, against the wishes of their parents. Or in another case, which estranged parent (the devoutly religious father or the recently turned secular mother) will get to choose the educational path for their children. Or whether a seventeen year old Jehovah’s Witness, who suffers from leukemia, will receive life-saving blood transfusions against his will, and the will of his parents. The case of Adam, the young man who suffers from leukemia, forms the main plot of the novel. As readers, we watch Fiona grapple with her decision. She takes the unusual step to meet and talk with Adam in his hospital room where she is charmed by his earnest innocence. We are privy to what she decides, and why. And of course we experience the stunning aftermath which has such serious consequences for Adam and for herself. I truly loved this book. As Sam Sacks says in his review in Wall Street Journal, “literature is a better place when Ian McEwan is at his best.” And he’s definitely at his best in The Children Act. Make sure you clear your calendar before you start this one, though, folks. It’s very hard to put down. 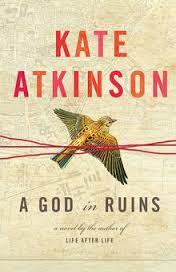 The other book that I would recommend you NOT take on vacation is Kate Atkinson’s A God in Ruins. Seriously this book could ruin your beach holiday, have you holed up in your hotel room, snapping at family, friends, hapless hotel staff… anyone who interrupts your reading. Save this one for a rainy November day, by the fire, with numerous cups of tea and nowhere to go but right where you are. I think that Kate Atkinson is one of the best writers working today. And this book is hands down the best book I’ve read this year. A God in Ruins is the ‘companion’ novel to Atkinson’s earlier work Life After Life… which I haven’t read, by the way. While Life After Life deals with the many births and deaths of Ursula Todd, playing with time and chronology, and the idea that small moments changed can utterly change the course of a life, A God in Ruins is the story of Ursula’s younger brother Teddy. 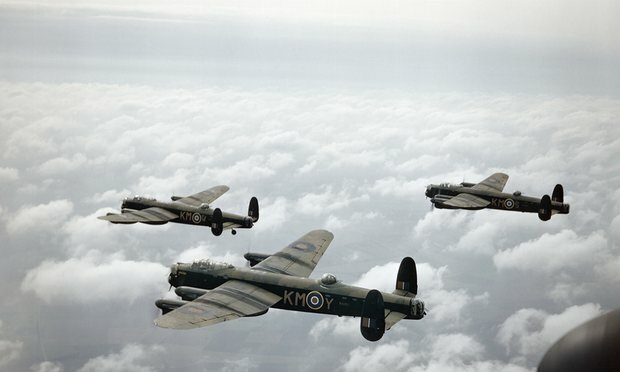 Teddy’s World War II experiences as the pilot of a Halifax bomber provide the main thrust of the plot, but Atkinson takes us from his idyllic childhood in the 1920’s through to his old age. She plays with chronology in this book too, flipping back and forth between Teddy’s youth, his war years, and his old age, as well as the lives of his acerbic daughter Viola, and even his grandchildren. Sounds confusing, but it’s not at all. Atkinson is a master plotter, and a brilliant writer. Atkinson like McEwan researches her subject extensively, and she performs what one reviewer calls that “elusive alchemy that transforms statistics and memories into immediate drama.” Her characters are engaging and flawed and absolutely compelling. Even prickly Viola. I particularly like what Anne Marie Scanlon said about the book in her review in the Independent.ie. That, like Teddy in A God in Ruins, “each of us experience multiple ‘lives’ during our lifetime as we age and change.” Because that’s what I was feeling when I was back home earlier in August and what I wrote about in my post Lost in the ‘Hood. I love how books and discussions of books can help us reflect on our own lives. One of the reviews I read of A God in Ruins used a shot from the television series Home Fires. Have you seen it? Based on the book Jambusters by Julie Summers about the English Women’s Institute during World War II, it chronicles the lives and war efforts of the women of a small village in Cheshire. I’d watch anything with Francesca Anis and Samantha Bond in it; they’re marvelous. Hubby and I both loved this series, and we’re excited that there is a second season. I’ve read a couple of other rainy day books this summer, most notably The Summer Before the War by Helen Simonson. Described in this review as the antidote for those “mourning the loss of Downton Abbey,” how could I resist? I’d read and loved Simonson’s first book Major Pettigrew’s Last Stand and had this one on order at the library for months. Set in the days leading up to World War I, and in the early years of the war, Simonson’s novel is not the masterpiece that Atkinson’s book is… but I still loved it. I spent one whole weekend curled up in a chair on the deck, moving once or twice to find some shade, then eventually retreating to the air conditioned sun room. By the time I was finished late on Sunday afternoon, my legs were cramped, supper would have been only a dream if not for Hubby, and a half box of kleenex was history. And speaking of history. It’s time this post was history. I have to go to the garage and pick up my car. Yesterday, post shopping trip with my friend Erica, trying to get out of the parking garage at the Rideau Centre, and caught in a traffic jam which had me sitting for fifteen minutes halfway up the very steep ramp… I … ah… may have done some damage to my clutch. That is, if smoke and a strong smell of burning is any indication. I sat there for ten minutes and wondered who the poor soul was whose car was producing that black cloud. Ha. That would be me, folks. To sum up. If you haven’t read these three books… you must. You really must. But be warned people. Before starting any of these, just know they will make you very unsociable, maybe even unpopular in your family. And any one of them is a vacation killer. So don’t take them to the beach. My best advice is to buy one or all of them, or check them out of your library, and pray for rain. How about you? Read any rainy day books this summer that you’d like to recommend? Thank you for these books and reviews. I also am a fan of Kate Atkinson and will read both those novels. I am currently reading Aluce Hoffmans' The Museum of Extraordinary Things…you might enjoy it. You're welcome. I will check to see if my library has Hoffman's book. Thanks. Sue, you and I really have similar taste in books! Ian McEwan is always a favorite (*Atonement*, oh yes) and I loved *The Children's Act*, which I read last year in one sitting. I couldn't stop! He is legendary for the amount of research he puts in and I for one really like all the details he includes. The Guardian ran a piece on him the other day and I was amazed by the lack of love in the comments – I think he is extraordinary, and like you said, he makes great writing look easy. Kate Atkinson is my absolute favorite – she has been from the day I read *Behind the Scenes at the Museum* many years ago. Have you read her Jackson Brodie series? You are in for a treat with *Life After Life*, another one I couldn't put down. I found a few luke warm reviews of Children Act; I thought the reviewers must be batty. Like you Behind the Scenes at the Museum was my first Atkinson…I really loved it. Then her Jackson Brodie series came along and I thought I'd died and gone to heaven. Loved the television series as well. I will say that Summer Before the War is a bit more romance-y than Atkinson's book… but speaking as someone who doesn't read Jodi Piccoult etc etc… I think you'll love it. She gets into all kinds of twentieth century issues of gender, class, sexuality. So glad you enjoyed Graham Hurley, Jenn. Oh, I just finished "A Man Named Ove." It's tramslated from Swedish or Norwegian and quirky as all get out. Wonderfully fulfilling positive read. I immediately thought it would make a marvelous movie. Too late it's just been made. Do yourself a favor and read it. I will have a look at the library for that one too, Sandy. Thanks. I've read all Kate Atkinson's books , including Life After Life , & really enjoyed them but couldn't get through God in Ruins . I developed a real soft spot for Teddy & found the second book depressing ( had a quick look at the end too ) so didn't finish it . Perhaps I was in the wrong mood & should try again . Enjoyed Major Pettigrew & have Man Called Ove in the book pile . Just finished American Wife by Curtis Sittenfield – Loosely based on Laura Bush & very good . Do you know it ? Before that was The Paris Winter by Imogene Robertson , an historical thriller . It was a little melodramatic but sent me off researching the history of opium use & the Paris floods of 1910 , so found it worth reading . Next is Clara Callan by Richard B Wright . I was the other way round, Wendy. I was so immersed in A God in Ruins that I got Life After Life from the library a couple of weeks later. I couldn't read it. Partly because it covers some of the same ground, early family life at Fox Corner etc. But mostly because I knew what I knew from the ending of the second book and found I couldn't go through all the emotion again. Hope you like Clara Callan…I loved that book. I, too, loved, loved, loved A God in Ruins- the ending still haunts me today. I also loved the Summer Before the War. My husband and I spent a week in London last January and visited the Churchill War Rooms and the Imperial War Museum, as well as several WWII related London walks- so I have the scenes set for many of these novels. 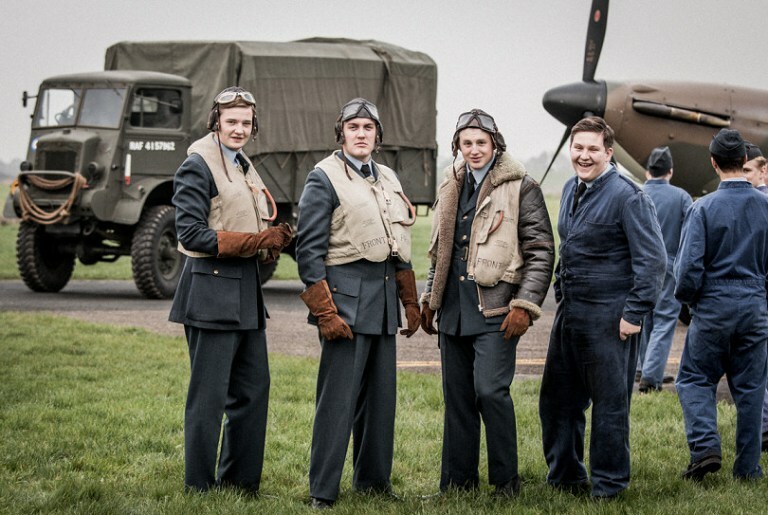 Can't wait for season 2 of Home Fires as well! That sounds like a fabulous reader's tour of London, Pam. 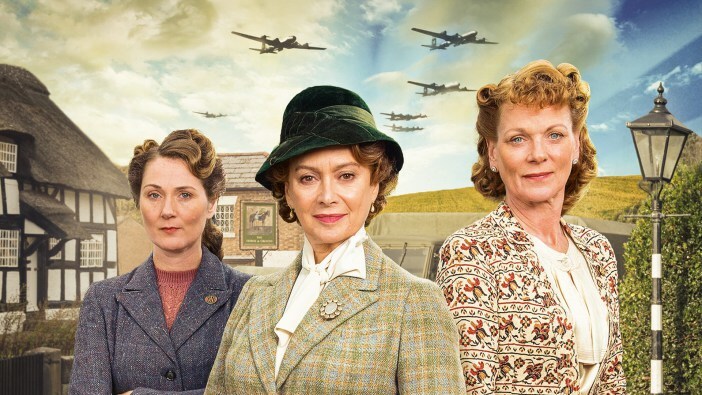 I'm hoping that we're to get season 2 of Home Fires. I know they made one and aired it in the UK this past spring. But I can't find any mention of it on the PBS website. I'll be so disappointed if we don't see it here. Like you, love all Kate Atkinson's work, and this one in particular. It's the first time I've said the word 'palimpsest' out loud when describing it! I read McEwan too, who I'm less keen on since having read Saturday twice (something I rarely do with contemporary fiction) and was left feeling the nuts and bolts of its construction were too obvious on a second reading, and I was also irritated by what seemed like showing off – all the details of the operation the author had researched. I did rather feel that with this title too… I thought it was a very male type of thing. Atkinson gives information and facts much more subtly. I couldn't read Saturday, although I tried. But I loved Children Act. Still .. few writers outdo Kate Atkinson. I will definitely put A God in Ruins (have already read Life After Life) and The Children Act on my list. After a substantial wait, I just downloaded my library ebook of The Summer Before the War. I loved Major Pettigrew, so have been looking forward to this one. My favorite this summer so far has been Everyone Brave is Forgiven. I'm somehow hooked on the WWII era lately. Thanks for that Laurel. I will put Everyone Brave is Forgiven on my library hold list. Our library has a wonderful way to order books, and suspend an order if you will be on vacation etc. I always put a "hold" on a book as soon as I hear of it…sometimes I have to wait months, but since I have a ton on there, I'm always "pausing" them until I get caught up on my reading. Hubby calls it "managing" my reading. Maybe you are like Wendy and won't want to read the second book. A God in Ruins does not play with time as much as Life After Life… although it does a bit. What's that you say? There's another Mitford biography. I guess I should read it. Can one ever know too much Mitford-mania, I wonder?? Nah. Oh how I loved "A God in Ruins." Read it months ago and still think of it often. Also really liked "The Summer Before The War." "Atonement" broke my heart and I haven't been able to read Ian McEwan since! Perhaps I should give him another go. Like another commentor, I'm also hooked on WWII novels this summer. Very much liked "Everyone Brave is Forgiven" and can also recommend "Code Name Verity." And anything by Alan Furst or Philip Kerr. I became so caught up in The Children Act that I explained in great detail to Hubby all about the cases that the character was trying… as if they were real and not fiction. That's the second recommendation of Everyone Brave is Forgiven… it's definitely on my list, now. Home Fires was wonderful! Where did you see that a second season was coming? I hope so! I saw somewhere they would not be doing a second season. Me too. I read that they made a second season and aired it in the UK last spring. But haven't heard if and when it's coming to North America. If Life after Life had gone on for another 500 pages, I would have loved it even more, if thats possible. It was my favorite book of that year and I could not imagine that she could equal it. But a God in Ruins was a feat of a different but equal order, and affected me so much that I could not start another book for days and days. Nothing I have read so far this year has had that inpact. I am still looking! I felt the same about A God in Ruins…started another book right away but found my head was still in the Kate Atkinson book. I will add all three on my reading list,after your beautiful reviews. Loved Kate Atkinson and have read life after life. Thanks, Dottoressa. Uncommon Reader is wonderful, isn't it? I'm on the second book of the Steve Burrows series that Frances recommended. Enjoying them…even though I am NOT friendly with birds. A bit phobic, actually. Sorry that you had trouble with comments today. I received this comment in my e-mail in-box, and then the second one a bit later. But when I went to the blog they were not there. I found them in the spam folder. So I "unspamed" them, and deleted the second comment. Thanks! It happens a lot lately,don't know why! I'm late making my responses! I've been reading up a storm (no pun intended considering we had a whopper the other night) since Stu is away fishing! My name is on the waiting list at the library for The Swans of Fifth Avenue. Hope you like Children Act, Beth. Timely post! I just requested McEwan's newest, Nutshell, and was thinking that I should read The Children Act first, especially since it has been waiting patiently on my list since it came out. Surprising for me because I used to gobble up McEwan. As for Kate Atkinson, both this book and Life after Life have been on my list for ages. Perhaps I should read Life first, and allow some time, before proceeding. There is no wait at the library for The Summer before the War, so I shall request it. I loved Major Pettigrew, and it sounds like a fun read. I saw that McEwan had a new book out. Must put my name on the waiting list if it's at the library yet. I liked Summer Before the War every bit as much as Major Pettigrew…. hope you do too, Mardel.